Aluminum outdoor rustproof storage solution! The Kayak Dock Rack is an innovative and easy-to-use outdoor storage solution. Save space by storing your kayak off the side of your dock or pier, and save yourself trips lugging your kayak back and forth to the waterside. Built for the Outdoors. Made from Aluminum parts and stainless steel hardware, so it is completely weatherproof and designed to withstand harsh marine environments. Space Saver. 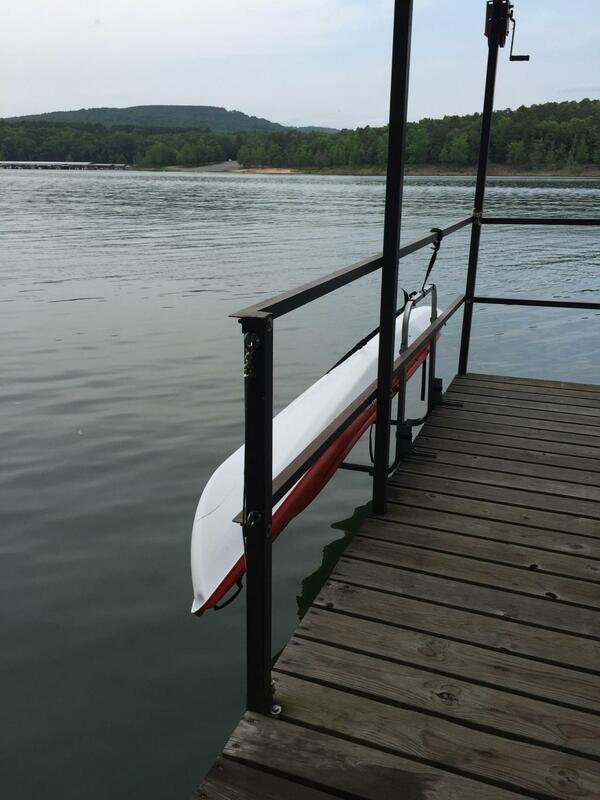 Great for narrow piers or walkways because it attaches to the side of your dock, with your kayak mounted over the water, saving you precious dock space! Lift Assist Arm. Makes loading and unloading your kayak simple, for anyone. The Rack folds down and inserts your boat into the water, and folds up to remove it from the water. An aluminum arm and webbing cradle swings down to (or up from) the water so you can maneuver your kayak into the rack while it is still in the water. Once your boat is in the cradle, swing the aluminum arm up and your kayak into its storage position. I See Two Options...Which is Right for Me? We get this question a lot! There are 2 versions of this dock rack that look very similar, but function slightly different. Continue reading to determine which rack is right for you, then select the chosen rack from the dropdown menu above. Dockside Rack (Right Video): The Dockside version is designed for entering and exiting your kayak from the dock. Ideal for docks in deep water or floating docks, accommodating freeboards (dock height above water) up to 30". Here's the major difference between this version and the Waterside Rack: The Dockside Rack will begin to tilt toward the water when you release the locking pins. This is ideal when you're on the dock because you'll be above the rack and able to control the descent with the included line (see video). Waterside Rack (Left Video): if your dock is in shallow water and you will board your kayak by standing in the water, select the Waterside version of this kayak rack. The Waterside Rack operates differently in that it will not begin its descent until you, the operator, manually move the lifting arms. This is a safety feature that is not necessary when using the other rack from the dock. 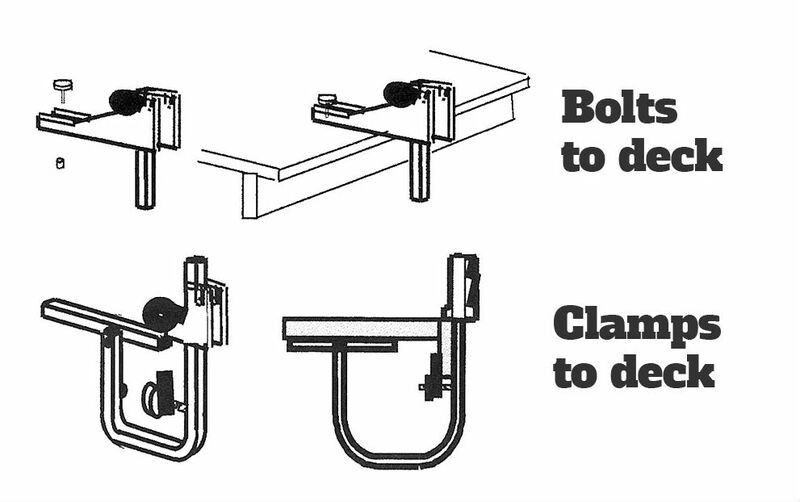 2 Dock Mounting Options: (1) Bolt-on and (2) Clamp-on. Both options fit decks 1" to 1.5" thick and include 2 slots to provide for vertical adjustment to meet different water levels. Dock must have side height less than 7.5"
Still deciding? Check out our writeup on why we recommend this rack for waterfront properties. For dockside storage of multiple boats we recommend our SUP & Kayak Dock Rack. Maximum kayak width = 34"
Rack position (distance rack sits below dock) = 5 - 9"
Freeboard (distance between dock surface and water surface) = 10 - 30"
Rack position (distance rack sits below dock) = 5 - 17"
Freeboard (distance between dock surface and water surface) = 10 - 36"
Will this work if I live in a tidal area? If you live on a tidal body of water we recommend using this on a floating dock. Will this work in saltwater? Yes, the aluminum will withstand saltwater but it will most likely develop a white crusty buildup. We recommend the stainless steel kayak dock rack for salt water applications. To bolt this on to my dock, do I need to get under the dock? Our kayak dock rack has two different mounting options available during checkout. For the bolt option, it comes with snaptogglers; if you use these to mount the rack, you would need to access the underside of your dock to secure them in place. 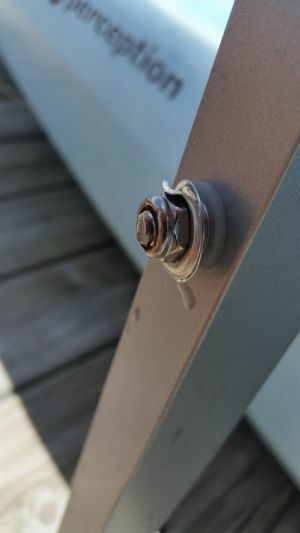 However, if you don't have access or there are structural members under the decking, you could get a lag bolt from a hardware/home improvement store and use that instead. With the other mounting option, the clamp mount, you definitely need to have access underneath your dock. Is this dock rack good for a tidal river? If you have a floating dock, this rack will be fine for a tidal river. However, this rack is made out of aluminum, which will work fine in salt water, but there may be salt build up over time. The stainless steel version would be the preferred rack for use in a salt water environment. How far down into the water can this rack go? - In the lower position the rack will manage Dock Decking to water heights of 14 inches to 30 inches. Will this work for a Hobie mirage oasis, width 34"? Yes, we have many customers with a Hobie Oasis using this dock rack! For an Oasis, as with all Hobies with the Mirage drive, we recommend that the Mirage drive be removed prior to loading the Hobie in the rack -- the Mirage drive is very easily removable. This will prevent the rowing fins from engaging in the lifting straps. Our dock is for a lake and has no overhang. It is an Endres manufacturing wooden dock. Which mount would work with our type of dock for the kayak dock storage? Either the bolt-on or clamp-on style of mounts should be fine for your dock. One consideration might be that if you choose the clamp-on mount, you will have the freedom to move the unit from location to a different location on your dock. Once you install the bolt-on, the mounts are in that fixed position. Can I mount this to a concrete sea wall? We have had a couple of customers mount this dockside Kayak rack to a concrete sea wall, with success. You would need to choose the Bolt On mount for that application and use concrete anchors. The top of the concrete wall should be perpendicular to the side., not sloped to any great degree -- that would work best if you were to try this. Our kayak dock rack system does not have a built-in lock, however you could choose to use it with something like these universal kayak locks (available in a couple different sizes, for different size boats) or these kayak dock locks. What to you suggest for heavier Kayaks. I have a Hobie PA 12 which is listed at 129 lbs? We really don't have a comparable rack to this dockside kayak rack (that holds kayaks up to 100 lbs), that will work for a larger kayak. So for a kayak the size of your Hobie, we would suggest the extra-large version of this marine grade kayak rack. The extra large version can hold a kayak up to 150 lbs, and is well suited for mounting outdoors. I have a Hobie Mirage Oasis....if we remove the peddle drives is this the best durable product for us ? Ease of storage and launch is important. We have many customers with a Hobie Oasis using this dock rack! For an Oasis, as with all Hobies with the Mirage drive, we recommend that the Mirage drive be removed prior to loading the Hobie in the rack -- the Mirage drive is very easily removable. This will prevent the rowing fins from engaging in the lifting straps. So we find it works well - as long as your Hobie is under 34" wide at its beam, you should be fine and find this a durable solution for storing and launching your kayak, and easy to use. I have a 9 ft dingy with a 3 horse power motor on it.,... Do you have any ideas to get it out of the water every night? I liked this lift, but I think my boat is too big. The kayak dock lifts would be a question-mark for your dinghy, and its motor, though small, may get in the way of it working as well, so its not something I can really recommend. The length of your dinghy would be less of an issue than its shape, as even most canoes won't work on this lift/rack due to their shape. Regarding the motor, for kayaks that have pedals drives, one has to pull them out before using the lift, as they get in the way of it working properly - while a dinghy motor is different, it could still affect how it would sit in the rack and the lift would operate. Unfortunately I don't have another suggestion that I could offer guaranteed to work. What is the minimum distance between the waterline and the top of the deck for mounting these racks?We are going to build an extension off our existing boat dock which is closer to the water, say 4 to 5" above the water level, to make it easier to get in and out of the kayaks, and are wondering if the kayak racks can be mounted this close to the water. b) in storage, the distance the kayak is above the water ranges from 5-21" (again, based on water level). Lifting: When you are actually lifting/lowering the kayak to and from the water, the rack position will be below the dock/platform's surface either 5-17" (waterside version) or 5-9" (dockside version). Hopefully the additional numbers may help you plan what could work for your intended dock modification. Can this unit lower the kayak 5 feet down? This Kayak Dockside rack can lower your kayak up to 30" - so about 2 & half feet down maximum, from the top of your dock. What is the difference between the dockside marine storage mount version and the waterside outdoor storage mount version? Both products list for the same price. Both of the above versions appear to be aluminum, and there appears to be another that is stainless steel. All 3 appear to support 100 lbs. What is your recommendation and why aluminum vs. stainless steel? 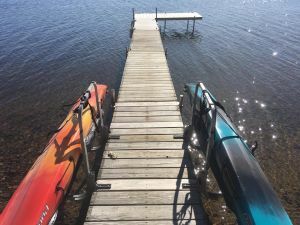 There is one a main difference between the Dockside and Waterside version of these dock racks, and that mainly is about how you want to use the racks to enter your kayak. 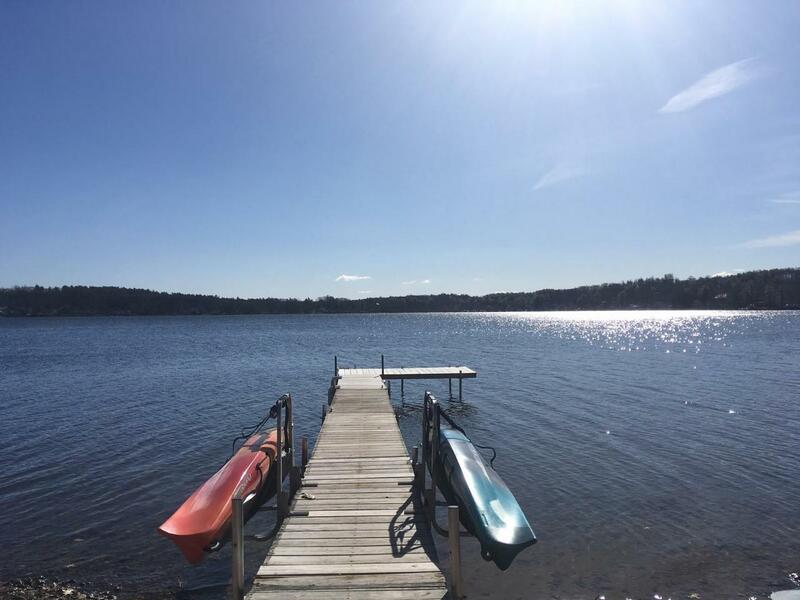 Will you be entering and exiting your kayak from the dock, or while you are standing in shallow water? If the dock isn't, and you can enter our kayak while standing in water, then the waterside version would work. As you noted, they otherwise support the same amount of weight (up to 100 lbs) and kayaks up to 34" wide at their beam. The Stainless Steel version is available only as a dockside rack (for entry-exit from the kayak from and to the dock, not in shallow water). It is marine-ready, so if your dock and waterway is either saltwater, or near enough to a saltwater inlet and/or salty air, the stainless steel version gives you additional protection from the elements for the rack system. 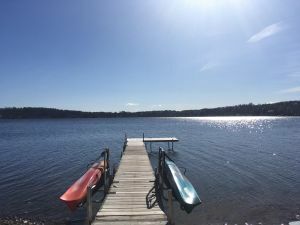 But if your dock is on a freshwater lake, not near saltwater or air, the stainless steel isn't necessarily needed, the aluminum version would do fine. I just purchased the predator which has an electric motor. Will this dock rack be adequate? Your Predator is probably going to be too wide at its beam to work for this dock rack; this rack will only work for kayaks that are no larger than 34" at their beam, and I am fairly certain the Predators run larger than that. If it is no more than 34" at the beam, the motor/engine would probably be an issue. I am not sure how those engines are set-up - with with some model kayaks that have a drive, you can remove the drive and this dock system will work, but I am not sure if that is feasible on the Predator (if it was less than 34" wide). So it doesn't look like a workable option for your boat. 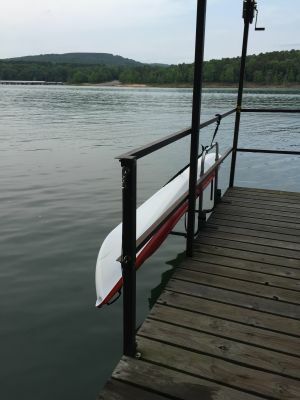 We don't have a comparable lifting/lowering system that we could recommend for your boat, but here are some of our other dock/pier racks though: https://www.storeyourboard.com/kayak-dock-pier-racks/. I am not sure if I have a Truss Dock. A Truss Dock is usually metal - aluminum or steel - and the dock planks sit on top of a that metal frame system. The sides of those docks have metal supports that are usually shaped like "X"s or criss-cross and are open (you can see through the criss-crosses). You would probably know if it was that type - if still not sure, you can send us a photo and we can help you identify it. Do you make a rack that can be used to house both a kayak and an SUP? This Kayak Lift Assist Dock Rack also works for a SUPs that are up to 34" wide; you can see it listed for SUPs here, but they are the exact same rack. It can only hold one item at a time though, it isn't available as a double rack. So if you needed to use the rack for both a kayak and a SUP at the same time, you would need two of them. Unfortunately, this dock rack system doesn't work for most canoes because of their shape, it interferes with the system that raises and lowers the boat, so I can't recommend it for your Old Town. I need to secure kayak and paddle board. Do you have one product that allows to secure both of these? I'd rather not have to buy 2. One that fits 2 is ideal. There isn't a 2 board/boat version of this particular dock rack system. This is probably because it's built to help lower/raise an individual board/boat into & out of the water, and hasn't been designed to have two levels that could perform that function. We do have some other dock racks for your consideration, such as this 2 kayak/SUP rack that holds your board & boat over the water. My kayak is 35” wide, and this rack is recommended for 34”. Can it still work for my kayak? Unfortunately, we really cannot recommend this dock rack for a boat bigger than 34" at its beam. Even though an inch doesn't sound like much, it can affect how the lifting part of the system works and there can be other issues. Unfortunately, we don't have a comparable type of rack that stores & hoists your kayak to recommend that would work for a larger kayak. Here is the rest of our dock/pier kayak rack collection for some other types of kayak rack options: https://www.storeyourboard.com/kayak-dock-racks/. Is it possible to hang a double place kayak on these? The main consideration for whether your kayak would work on thisdock rackwill be its width - it has to be no more than 34" at its beam, and no more than 100 lbs, for it to work in the system. It otherwise should be fine if it falls under that weight & width specification. How far apart are the vertical upright pieces of the rack? They are about 32 inches apart and go into the mounts on the dock . I would like to know more about the freeboard distance between water and dock. There are several factors in deciding which of the versions of this kayak dock system - the "waterside" or the "dockside" -- will work for you and your dock, and determine whether you will enter-exit your kayak while in the water or from the dock. The "Freeboard" measurement you were asking about is basically the dock's height above the water. The number of inches between the surface of the dock, and the surface of the water, affects which one to choose, as follows:The waterside version works for docks that have between 10" and 36" between the dock's surface and the water's surface;The dockside version works for docks that have been 10" and 30" between the dock's surface & the water's surface. So the waterside is required if you dock is higher than 30" above the water, up to 36" high. If water level varies, you would look at what the highest water surface level would be. Can the upright arms be shorter to accommodate a narrow slip? The distance between my boat and the dock is about 3 feet. 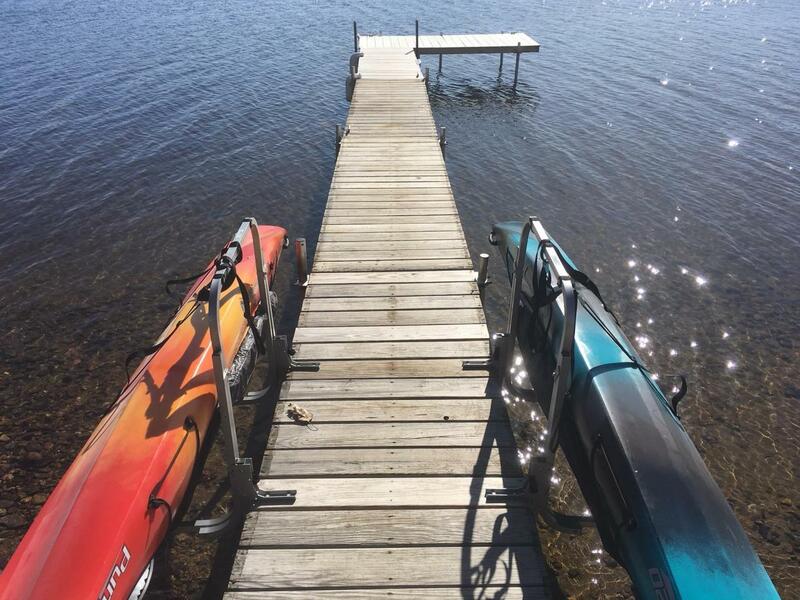 For this Kayak Dock Rack, with lift assist, the bars that lower and raise the kayak into the water are not adjustable in their size; they are built at that size so they can function to properly raise/lower the kayak. I can't think of a work-around for a smaller slip like that; the only option would be another type of outdoor kayak rack, that doesn't have the lift/lower function, such as this stainless steel rack, as one alternative for consideration if space is limited. I have a floating Metalcraft dock. Has Aluminum decking and support beam along the edge. 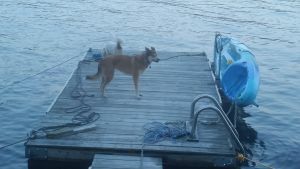 How can I secure a dockside rack to my dock? For this system, it can work for aluminum docks if one chooses the "clamp-on" option as the mounting hardware that would be included. We have a poly floating dock. Will this work? This Kayak Dock Rack can work for floating docks; you would want to choose the dockside version during check-out, as that one is better-suited for floating docks. For a poly dock -- if that is a composite type of docking material, you could choose either type of mounting hardware, the clamp-on or the bolt-on; the clamp-on might be better-suited for your dock, as long as you have access to the dock's underside for installing it. This Kayak Dock Rack can work for floating docks; you would want to choose the dockside version during check-out, as that one is better-suited for floating docks. For a poly dock -- if that is a composite type of docking material, you could choose either type of mounting hardware, the clamp-on or the bolt-on; the clamp-on might be better-suited for your dock, as long as you have access to the dock's underside for installing it. Is there any limitation on maximum length of kayak this system will accommodate? Will it support a 14.5’ kayak. There really isn't a length max on what this kayak dock rack can hold -- but there is a width max, so as long as the kayak was no more than 34" wide maximum, at its beam, it would work for that boat. If I buy the dockside design can you still enter it from the water? 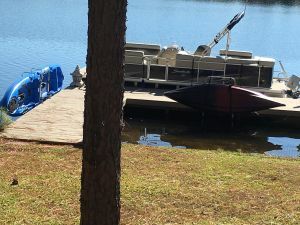 For these dock racks, the use of the dockside one is not recommended if you are entering your board or boat from the water. The main reason is safety, because they way the dockside version works is a little different then the way the waterside version works. Basically, the dockside version works by rotating the boat or board at a certain point during use, which you control from above, on the dock. If you were to try to maneuver that system from the water, there are some potential safety issues, and you could potentially loose control and the boat/board could rotate on its own in a way that could cause personal injury to the operator or someone nearby. 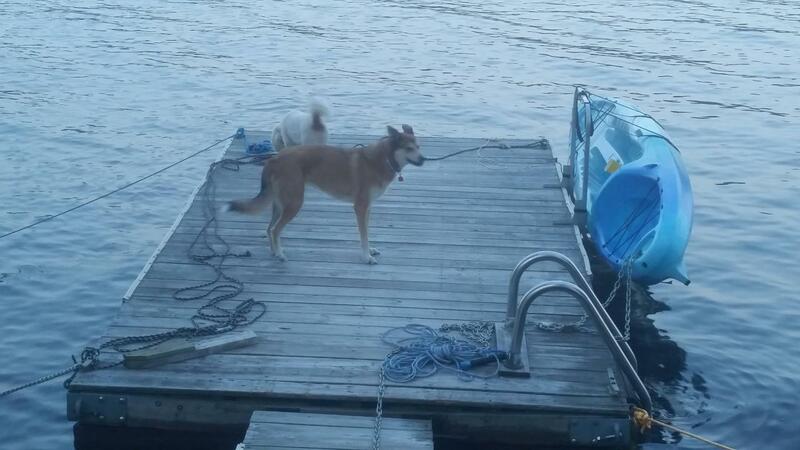 You just aren't able to control that version as well from the water; since it is built to be operated from the dock. So really, how you want to enter the boat on a regular basis is going to be important to decide for which version would work best. If you prefer to enter your boat while in shallow water, then you would want to get the waterside version, which operates to work best for that use. This rack is the best ever. This is the second one I’ve purchased. Both are in use all summer. So easy to use and no more tugging and pulling the kayaks to get them out of the water. Just simply float the kayak onto the straps, lift the bar of the rack and the straps lift the kayak out of the water with very little effort. Would highly recommend this product. It was hard before having to launch the two kayaks but the storage units make it easy to put them in the water and out. Easy to install and works well. Am using in salt water so time will tell how it will hold up. It gets the kayaks off the dock and makes use of them much easier. 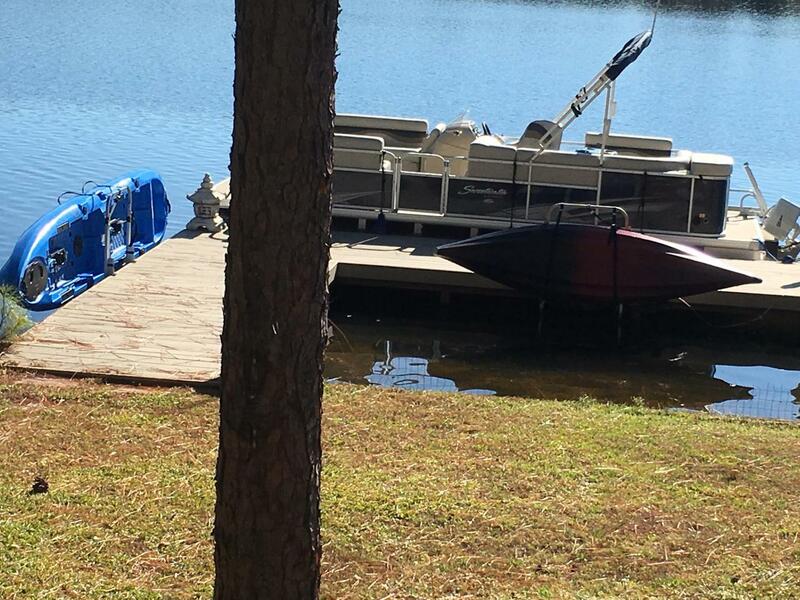 We purchased the units and installed them on our dock, and loaded our kayaks on. So far, we are really pleased. This review could go up to an excellent if they continue to function as well as they have to this point. There is a hitch in the installation instructions...how to mount the rack onto the base (hint, it rests on the cotter-like pins) but that is not obviously spelled out in the instructions, but after 15 minutes or so, I figured it out. As I say, so far, so good. I purchased this kayak lift so my wife can take it out of the water herself when I’m not home . Too my surprise our sea wall is to high and she can not lift the kayak into the slings , my fault for not measuring. We lowered the slings as far as possible, and lowered the rack down all the way , this is a good product and I would recommend it , it just did not work for our application. We just installed the kayak dock racks over the weekend. We have a narrow 3 foot wide dock so we didn't have any extra room for boat storage. The kayak dock rack keeps the boat just outside of the dock for easy pass through. Launching the Kayaks couldn't be easier. Excited to receive kayak rack as the design was exactly what I was looking for. Box received with missing snap button. Then when installing bolt snapped off. Requested new parts from mfg. Received and continued to install, then strap broke. Received new design strap from mfg. Finally installed! Not used since installed - a bit concerned that it is rugged enough, may have to return and find alternative product. Great design - just lots of issues. PERFECT Kayak Launch and Recovery System! Although I can lift my kayak in and out of the water to our dock, it's large size made it very awkward to handle and I was afraid I would eventually hurt myself. Our dock is about 2 feet above the average water level and when I am standing in the water it is just at head height. This was the perfect storage and launch solution in one! We learned of this device through a neighbor and immediately ordered it when we saw how easy it was. My husband installed it easily and now I am able to launch and recover my kayak easily from the water. The device takes all the weight of the kayak and it is quite easy to operate and secure. I highly recommend this kayak dock rack! This dockside storage rack for my kayak is great!!! It is so easy to use and now I can use my kayak by myself. I don't need anyone to help me lift it down the hill to the lake--it's right on the dock ready to go. I got tired of putting the paddle board in and out of the water every time someone wanted to use it. I got even more tired of friends and guests damaging the board and figured it only a matter of time before it was destroyed. The kayack dock rack is a great solution. Now my wife and kids can take the board out without my help any time they like. The board is secure, out of the water, and off my lawn! Everything went as planned. Only comment would be that you should go ahead and include 4 lag bolts... why make us run to the store for $1 of parts? The rack works as advertised. It is hard to pull up with the furnished strap. It could be improved if the strap had handholds on it so it would be easier to grip. Another possibility would be a fixed bar across the top with a block and tackle type arrangement to make it easier to pull up. I would recommend this lift!! I am 63 and I can lift or launch my kayak by myself!! !